Over the past 20 years, teaching English as a Second Language (ESL) has grown by leaps and bounds and now generates billions of dollars every year. Waiting lists for class space attest to the overwhelming demand for ESL instruction in North America. 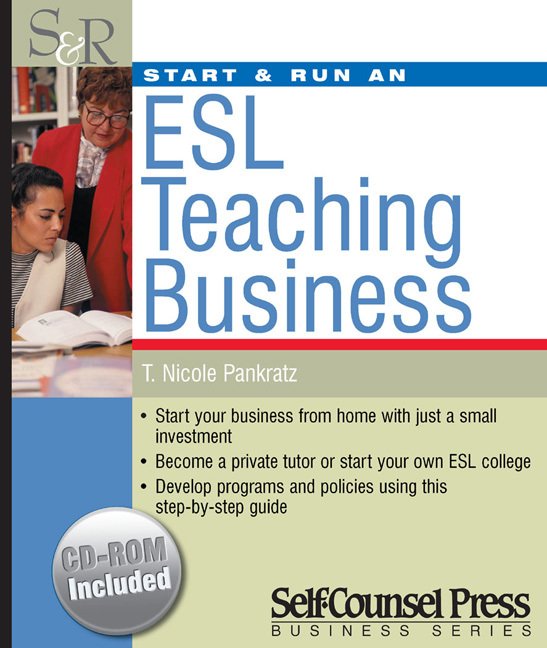 This book provides all the hands-on practical tips you need to start your own ESL teaching business. Whether you want to begin tutoring from your home or start your own ESL school, this book provides the step-by-step guidance you will need to make your business a success. Teaching ESL is ideal for people with an entrepreneurial spirit. While related to formal education, ESL is more about business than it is about school. Those who do well in the ESL industry understand that students are in many ways customers. It is one thing to understand and know how to teach English grammar; it is quite another to start and run a successful ESL school. Start & Run an ESL Teaching Business will show you how to translate an interest in teaching and working with people from other countries into a profitable business.